Norway will be the “Country in Focus” at the 2019 European Film Market (EFM) of the 69th Berlin International Film Festival. The EFM “Country in Focus” programme was established in 2017 to provide a platform for a comprehensive look at the film industry and filmmaking in a particular country. 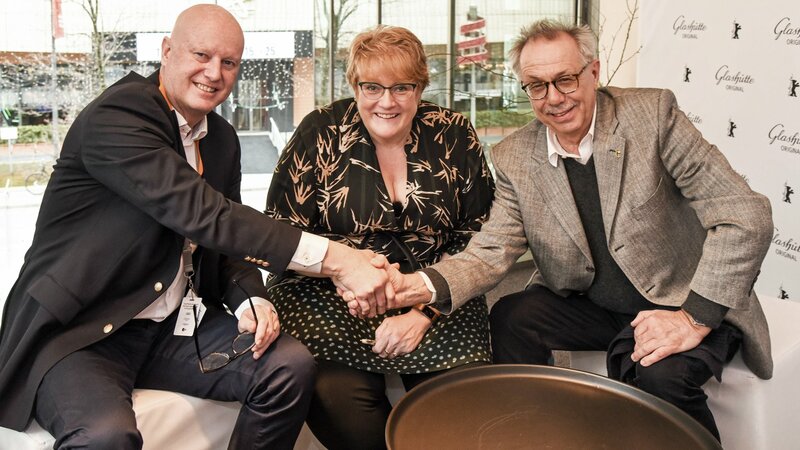 From left, CEO Sindre Guldvog, Norwegian Film Institute, Norwegian Minister of Culture Trine Skei Grande and Festival Director Dieter Kosslick, International Filmfestspiele Berlin. Photo: Lia Darjes, European FiIm Market. At next year's EFM, the spotlight will be on Norway’s filmmakers and productions. The programme will offer a host of possibilities for networking with Norwegian producers, distributors, investors, and creative talents, as well as the chance to take a closer look at Norwegian productions. “Norway in Focus” will be supported by the Norwegian Film Institute against the background of a German-Norwegian partnership. The idea is to intensify the exchange between the two countries in the culture, business, science, and technology sectors. “Norwegian cinema has a long tradition at the Berlinale, and numerous prizes are proof of the success of Norwegian filmmaking. Following Mexico and Canada, our “Country in Focus” programme will turn its attention to a European country for the first time. We look forward to further strengthening our cooperation with Norway”, says Berlinale director Dieter Kosslick. "It is with great pleasure we can announce that Norway will be "Country in Focus" at the European Film Market of the 2019 Berlinale. I am very enthusiastic about this opportunity to present and promote both Norwegian films, and Norwegian arts and culture in general”, comments Norwegian Minister of Culture Ms. Trine Skei Grande. EFM Director Matthijs Wouter Knol adds that “Norway’s presence has been crucial to the development of the EFM from the beginning, with many films and, in recent years, TV series too, being shown at the market. Norway’s international outlook on the film industry, and the myriad of opportunities that the country offers the international film sector, make Norway a very exciting partner for the EFM. We look forward to putting together great content for the programme, the details of which we'll announce in November".